Big data can provide enhanced insights on the world around us. When data is presented in a visually pleasing and easy-to-understand format, it is quite captivating. Deciphering Data will be a recurring series bringing you a round-up of the coolest data findings (including interactive graphics) from around the web. If anything piques your interest, click-through to read more. After the recent (August 2014) earthquake in California, company Jawbone used user data to track how the earthquake impacted people's sleep. This isn't as creepy as it sounds—Jawbone provides wearable tech gadgets, including the Jawbone UP fitness tracker, that tell users about their activity and sleep. In the graphic (below), you can see how people woke up at the time of the earthquake, and many remained awake. Interactive/visual data website Our World in Data brings you an intriguing presentation: The Visual History of the Rise of Political Freedom and the Decrease in Violence. Violence rates have been declining for hundreds of years as more countries have become democratic and individuals have received education at increased rates. Though it may seem our world is quite violent due to the saturation of morbid events in the media spotlight, in reality we are living in a relatively peaceful time. Imagine reading the news or checking Twitter at 1450-levels of violence! 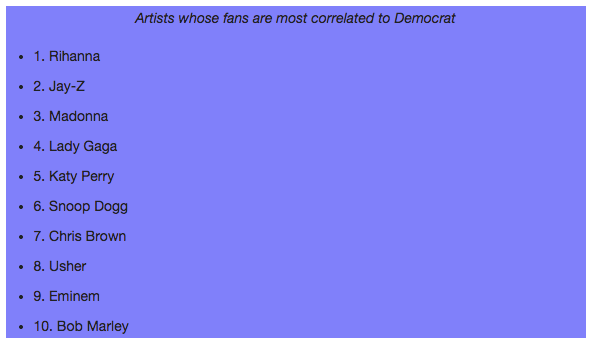 They also found that "overall, for every 10 unique musical types Democrats listen to, Republicans listen to just 7." This tidbit reminds me of a fascinating Vox article highlighting the ideological basis causing disagreements between the Republicans and Democrats, including that "Republicans prefer purity, Democrats prefer compromise". Perhaps the Republicans prefer purity in their Itunes library as well as their government! 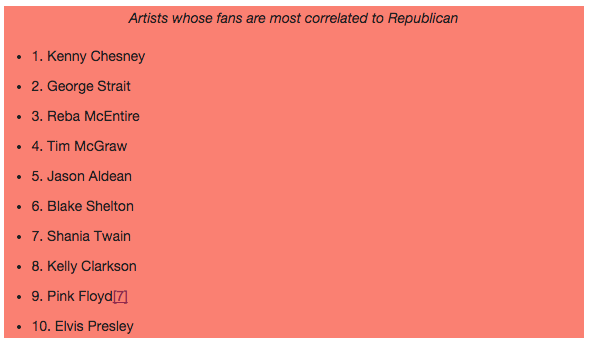 The findings by Spotify on political party are just a drop in the ocean of they data they've collected. Spotify has also released findings on the various musical qualities different colleges have. They used student subscription data to determine which schools like which genres, tones, themes, times of day, and more. I included the graphic from the Northeastern University findings, as I'm biased, but you can see the other 40 schools' data here. Northeastern was voted "least likely to like Juggalos". This reassures me to some extent, though it implies that other schools like Juggalos more, which I find to be quite disturbing. If you don't know what a Juggalo is, search on Google Images... You probably won't regret it. FiveThirtyEight also wrote about Spotify's ability to take your listening data and predict what else you will like. This isn't a capability that regular folks can access yet, but it's entertaining to read about how Spotify separated the writer's guilty-pleasures pop from his indie lo-fi music, and created separate "clusters" to recommend songs from. The recommendations turned out to be incredibly good! This service is theoretically coming to more people in the future, and is just one example of companies focusing on better catering to their user's tastes. "According to our internal metrics, at least, OkCupid’s users are better-educated, younger, and far more progressive than the norm, so I can imagine that many sites would actually have worse race stats." On a long-term compatibility level, it seems that just three random questions can predict whether a couple will be successful. They analyzed 32,460 real-world couples who met on OkCupid to determine what questions they answered similarly. "In fact, 32% of successful couples agreed on all of [these questions]—which is 3.7X the rate of simple coincidence. These questions as a trio even out-performs OkCupid's top three user-rated match questions." ¹This is an awful joke, and I am sorry I made you read it.